Scott and I (Nigel) wanted to combines both our interests and expertise in filmmaking and latin American culture. What sort of people will enjoy this educational holiday? 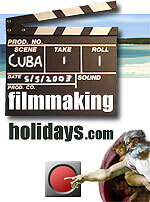 Those that like to be creative, learn new skills, desire to be a film director etc, or just delve deep into Cuban culture & society (in particular Salsa music & dance), rather than spend a whole holiday vegging on a beach. Are there any enrolment criteria? Can I email you; I have lots more questions?